Oliver Bulleid was the last Chief Mechanical Engineer of the Southern Railway, succeeding Richard Maunsell in 1937 and serving until nationalisation in 1948. Previously he had worked as assistant to Nigel Gresley at Doncaster works where he had served his apprenticeship under H.A. Ivatt. Trivia point - he was married to Ivatt's youngest daughter, Marjorie. Thorough biography of the man himself, but by no means lacking in technical detail. Lots of interesting details about his life outside of the UK railway scene. An affectionate and very upbeat tribute by his son. Not a Bulleid specific book but the details of Merchant Navy and West Country perfomance during the 1948 inter-regional trials is fascinating for any steam buff. A technical book centered around timed logs. It would seem that at a West Country would have no problem in maintaining the 1998 Eurostar schedule in the UK! At last, here are some pictures of various preserved Bulleids taken by me. Borrow as you wish, though an an acknowledgement would be nice if you use them elsewhere. The 30 members of the Merchant Navy class were built between 1941 and 1948. Originally sporting an 'air-smoothed' casing over the boiler and the unique Bulleid valve gear running in an oil bath between the frames, the entire class was rebuilt by British Railways in the 1950's in the conventional form seen here. This shot shows Port Line at Sheffield Park station on the Bluebell Railway, ready to depart with a train for Horsted Keynes. Introduced from 1945 onwards the West Country/Battle of Britain Class was a scaled down version of the Merchant Navy design with a smaller boiler and grate area and reduced cylinder dimensions. Their 19 ton axleweight gave them 90% route availability across Southern metals. In the 1948 regional interchange trials sister engine 34006 Bude was the only locomotive to exceed 2,000 dbhp. 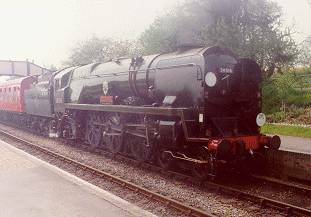 This photo was taken at Ropley on the Mid-Hants railway. British Railways also set about rebuilding the West Country's but terminated the program before the whole class was modified. Those left untouched are generally referred to as 'unrebuilt'. Here we see a rebuilt example arriving at Ropley on the Mid-Hants railway with a train from Alresford. Technically the West Country and Battle Of Britain classes are identical. The WC's have names of towns or beauty spots in the west of England. The BB's have names of airfields, squadrons and personalaties associated with the air defense of Britain during World War 2. In this shot unrebuilt 257 Squadron is about to pick up her train at Horsted Keynes on the Bluebell Railway, which she will haul tender-first to Sheffield Park. Bulleid at his best (or worst)! 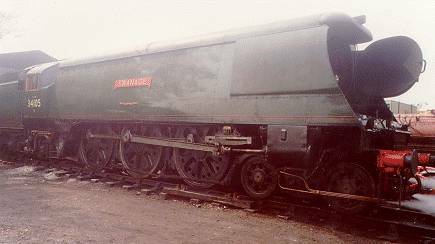 This wartime austerity freight design left no area of traditional British locomotive design unchallenged. All 'frills', eg running plate, were dispensed with. The result was the most powerful 0-6-0 to run in Britain. Its excellent boiler and steam circuit allowed it to run at up to 75mph. The entire class of 40 survived with no major modifications until the 1960's. 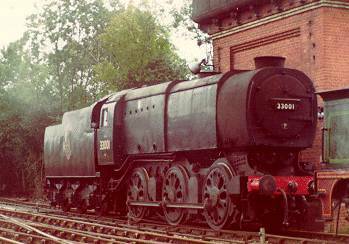 No 33001 (see note below) is part of the National Railway Museum collection but has been on loan for many years to the Bluebell Railway, where she is seen here at Sheffield Park. 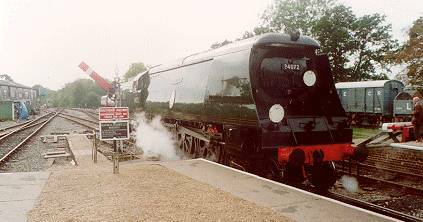 A word about Bulleid numbering. He set out to produced a more logical numbering system that would help to identify the locomotive type as well as its number, so a 4-6-2 pacific became 21C that is 2 leading axles, 1 trailing axle, three driven axles. Thus the first Merchant Navy started out life as 21C1, the second 21C2 etc. West Country's started at 21C101. The 0-6-0 class became C that is no leading axles, no trailing axles, three driven axles. So the class was numbered C1, C2 up to C40. It was all too much for British Rail who reverted to a more conventional system. 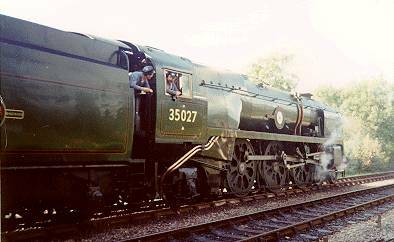 Note that 35027 pictured above never carried a Bulleid style number.